This page provides FREE products that are available through Lessonslearned.info. 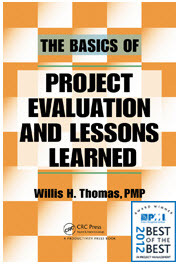 The Basics of Project Evaluation and Lessons Learned by Willis H. Thomas, PMP. 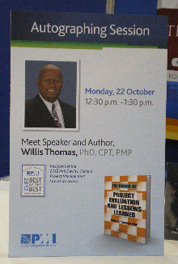 Project Management Institute Honors Author Willis H. Thomas, PhD, CPT, PMP with the 2012 PMI David I. Cleland Project Management Literature Award. The Project Management Institute (PMI), the world’s largest association for project managers, announces that it has honored Willis H. Thomas, PhD, CPT, PMP with the 2012 PMI David I. Cleland Project Management Literature Award for his authorship of The Basics of Project Evaluation and Lessons Learned. The award was presented during PMI’s annual Awards Ceremony on Saturday, 20 October 2012 at the Vancouver Convention Centre. The PMI David I. Cleland Project Management Literature Award recognizes authors for advancing the project management knowledge, practices, procedures, concepts or techniques that demonstrate the value of using project management. The publication may be on historical, current or future endeavors. Available through major on-line retailers, such as PMI, Amazon.com and Barnes and Noble. Currently in English only. For those who have purchased the book ONLY may download the other resources. The Project Evaluation Resource Kit (PERK) PERK contains contracts, checklists, forms, guidelines, job aids, plans, procedures and templates. PERKs is free of charge with the book and not sold separately. Instruments not included in PERK are variations, sometimes in an "advanced" form, i.e., MS Excel data sheets. Lessons Learned Project Documentation. Training Resources and Information Library (TRAIL) MS Access Database Full-featured electronic library created in MS Access for the purpose of storing references, i.e., books and magazines. To qualify for this as a FREE product, participating in research is required. Click here for the TRAIL Screenshot. Compliance Advantage Learning Management System (CALMS) (CALMS) is currently available for beta-testing. To apply as a beta tester, please click on the link (to the right) and submit a request through a technical assisance form. The beta version is available at a $100 trial fee cost, 20% of the retail product price. To qualify for this FREE product, participating in research is required. Click here for the CALMS Demonstration. Lessons Learned Dashboards Created in MS PowerPoint. Simply need to change variables to number of responder with colors. This is available FREE upon request to those who have purchased my book. Click here for the Dashboard Screenshot. MS Outlook for Lesson Learned This simulation demonstrates how to use MS Outlook to capture lessons learned. It overviews functions such as Voting Button to collect information. Sometimes you need to get a consensus from people regarding a decision that we needs to be made. This is available FREE upon request to those who have purchased my book. Click here for the Screenshot.Click here for the Screenshot. TELL Online Board Game Note: a printable TELL Board Game is included in the PERK FREE of charge. It is available on the CD at the back of the book listed above The Basics of Project Evaluation and Lessons Learned by Willis H. Thomas, PMP. Note: The electronic version of the game (as shown on the right) is intended for workshops and not available for sale. It utilizes 5 process groups and nine knowledge areas as outlined in the PMBOK 4th edition. Click here for the TELL board game. This page provides services that are available through Lessonslearned.info. The content developed by lessonslearned.info for you becomes your property to maintain and enhance as appropriate. Therefore, we have standardized on popular industry software applications. Media creation is a primary function, whether it is to support presentations or workshops. To review the primary software applications and tools utilized by with learned.info click here Software Library and Development Resources. Presentations are primarily for professional association chapter meetings and conferences to review best practices. Topics related to lessons learned in projects are customized based upon association requirements. Click here for an example outline. Sessions to capture or discuss lessons learned Scheduling is situation specific. Agenda to be discussed. Project Evaluation and lessons learned competency development for project team members. Courses are tailored at the introductory, intermediate and advanced level. See References under the Resources menu. Survey Development These are comprised of open and closed-ended questions that seek to capture lessons. Interviews are transmitted via electronic forms to allow incorporation into lessons learned database, repository or knowledge management system.